Having seen Highgate East Cemetery it was inevitable that I would want to see the West Cemetery. Unfortunately you may only see it as part of an official tour; still, it is better than not seeing it. On the day of my tour the sun was battling to stick out its head so light conditions varied all the time. I was also suffering from battery problems so had to use my cellphone as a camera while I passed the time at Highgate East. 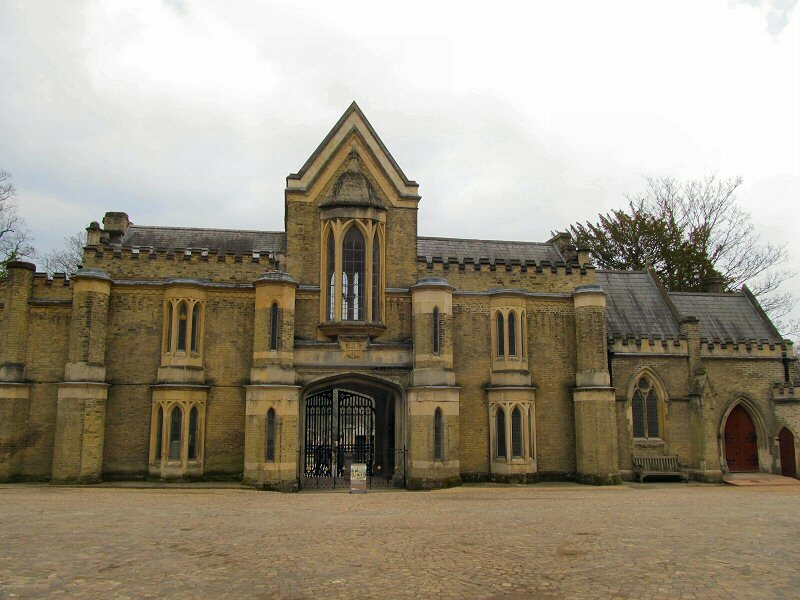 Entrance is through the ornate chapel/lodge/gate house and once through the gates up a flight of stairs to the cemetery. The cemetery is built on a hill so it is a upward climb for part of the way. There are quite a few similarities between the two Highgates, although the formal pathways here seemed much better than in the East cemetery. However, the same ornate memorials abounded, and again I was left thinking about what it must have looked like when it was open and funerals were happening here. The one thing that West has that East hasn’t are the crypts and mausoleums on a grand scale. The most famous being the Egyptian Avenue which was clever way to cash in on the Victorian mania for things Egyptian. Today it is more reminiscent of a casino gone wrong. The open topped avenue is lined with vaults and built on a slope leading into an even more grand area. One of the ideas at Highgate was to create a central vault lined pathway topped by a tree. This ideal still exists, although now it is somewhat of a faded representation of what it was supposed to be. Apparently the vaults did not really sell very well and many stood empty for years. From here a set of stairs took you up another levels where you could look down on this circular area and see the 300 year old cedar tree that served as a centerpiece. Once finished at the Egyptian Avenue we were on another level that led up to the crypt as well as another of the curved pathways that runs inside the cemetery. The crypt area is interesting because it is quite a large hallway with glassed in panels in the roof to let light in. It is a dark and gloomy place and were were not allowed to take photographs inside of it. Some of the chambers were open and we could see the coffins inside. The cemetery has its own ecosystem and the guide said that a colony of bats made this their home too. Given the atmosphere in the crypt all it would have taken would be one bat to make us all run for cover. The roof and chapel above was supposedly a popular place in the Victorian era and people would come here for a Sunday stroll and picnic. We were not able to see this “promenade” above because of safety issues, but it once afforded amazing views of London. Highgate is also famous for some of its beautiful headstones, and I am sure we missed some of them, but a few that we did see was “Nero the Lion”, headstone of George Wombwell. The grave of George Sayer with its famous resting dog. And probably many more that I never saw or that are not on the official tour. There are many considerations to be made when it comes to a cemetery like this. For starters safety is a major concern, many of the monuments are at drunken angles already, and the way underfoot is muddy in many areas. However, the question I ask is “who is really responsible for these memorials?” the cemetery is now run by “The Friends of Highgate Cemetery Trust” and by the looks of it they are now the custodians of those memorials and the bodies in the crypts. Burials still happen here, although it does not come cheap, and I expect more people get buried in the East Cemetery than the West. Part of me feels that I missed a lot during the tour which lasts just over an hour, but then I expect they can only show the areas that are safe. But I do hope that one day they will open up more of the cemetery so that we can see more of this Victorian “folly”, because if you look at it rationally, it is a folly, the people who created it never looked as far as 100 years down the line when it would be full, demographics would change and people no longer believed in having an edifice for a tomb. Maybe somewhere down the line, in another 100 years time people will be doing tours of our 20th century grid pattern cemteries and trying to to understand why we did things the way we did.